The Medium Maileg Bunny Light Ballerina dreams of becoming a prima ballerina. To achieve that, she practices her ballet moves every day in her pretty ballerina outfit. She loves to dance to music, spin her pirouettes and try some high jumps. To her huge delight, she notices that she is getting better and better each day. And when she does not dance, she likes to read exciting books or go shopping with her friends. She loves to buy new outfits from the Maileg medium clothing collection, because there she always finds a chic dress or a trendy sweater. But what she wants most, is to find a little human friend, that she can dance and play with. 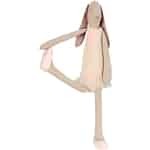 The Maileg Medium Bunny Light Ballerina will be a fantastic companion for your child.